Proper sharpening and maintenance is essential to upholding the life and value of your axe. Ensuring your axe is always properly sharpened and cared for will help you preserve the quality of your axe. Different sharpening techniques can be used, depending on the type of axe, its intended purpose, and the dullness of your particular blade. It is important to remember to identify and follow the bevel of your axe in order to retain the original shape of the blade. Maintain sturdy and continual pressure on the sharpening tool while sliding it back and forth against the blade and move at the proper angle to ensure maximum sharpness and efficiency. If your blade is heavily rusted or requires polishing, it is recommended that this be done prior to sharpening the blade. While this step is not entirely essential, it will help to guarantee maximum effectiveness as well as restore the aesthetic quality of the blade. You should repeat this process every so often so your axe will always look polished and pristine. To eliminate rust, begin with a rust eraser or steel wool. To polish, sandpaper can be used, and it is ideal to have multiple options varying from coarse to fine grit. Starting with the coarsest sandpaper, firmly rub the paper against the blade. Be sure to go in one direction so that it creates an even and smooth surface. Repeat the process with sandpaper of finer grit. If there is still rust on the blade, go over the areas again with even finer grit sandpaper. Once all the rust is removed, polish the blade with a metal polishing paste and rag. For blades that are particularly dull or have nicks or grooves that need to be heavily sharpened and smoothed out, it is best to use a flat, fine-toothed file. An emery wheel may also be used. It is extremely important to let the blade cool often so as to not stress or weaken the steel. Too much heat can cause steel to become fragile or tempered. 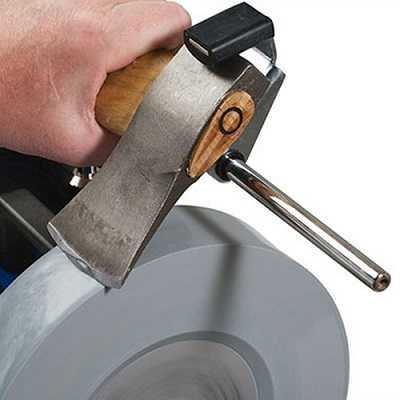 Maintain a slight amount of pressure on the blade and steadily move it from back and forth against the sharpening tool. It is essential that the pressure is smoothly distributed so to ensure even results. If the blade of your axe is curved, be sure follow the natural shape of the bevel. Alternately, if your blade is straight, the entire bevel should be securely pressed against the file or wheel. Repeat this process on the other side of the blade. If the blade of your axe only requires minor sharpening, or if you have already successfully smoothed out nicks and dull edges, switch to a whetstone or sharpening tool with a smooth and coarse side. Be sure to lubricate your whetstone. Water should be used with clay, sandstone, or similar sharpeners, whereas oil should be used oil for oil-based whetstones. An axe grinder may be an easier alternative if available. Secure your axe in a manner that will allow you to maintain a safe and secure grip on your stone. 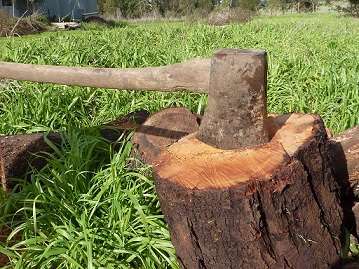 If using a grinder, use your body weight to create natural pressure against the axe. If using a stone, begin with the coarse side against your blade. Beginning at the end, use strong, steady strokes while moving back and forth in small, circular motions. Be sure to maintain the natural shape of the edge. Repeat this process on both sides of the axe until they are evenly and smoothly sharpened. If executed properly, an overhang or burr will accumulate on the edge. 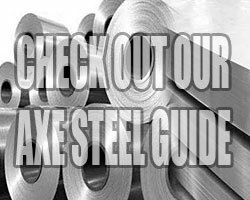 This is created when the steel strips away at the edge during the tapering process, producing a thinner and thus sharper edge. The burr or overhang is minimal but can be felt with your finger and must be correctly removed. To remove the burr that builds up on the edge, you will need the smoother side of your whetstone. Properly lubricate your whetstone. Use water for clay or sandstone sharpeners, and use oil for oil based whetstones. Rotate the stone in a circular motion against the edge of the blade while slowly moving from end to end. Distribute an even amount of pressure throughout the entire process so as to not create an uneven or irregular surface. Do this to both sides of the blade, switching back and forth periodically to keep the blade even. Be aware of buildup on the whetstone and be aware it should be wiped down often so the whetstone or blade does not become damaged. This step is completely optional but for the most refined and dedicated axe owners who wish to have an axe that is sharp, strong, and handsome, it is highly recommend. Honing your blade with a leather strap will give your axe a finer, keener and more polished appearance following sharpening. This will also give the sharpened edge of the blade an ultra-smooth look, while also making sure that no burrs remain. The end result is a blade with a sheen and sharp appearance. Use a relaxed but sturdy grip on your axe, so you can lightly stroke its blade against the leather. Your motions should always be going against the fine edge of the blade. Move the axe back and forth towards you with the blade against the leather. 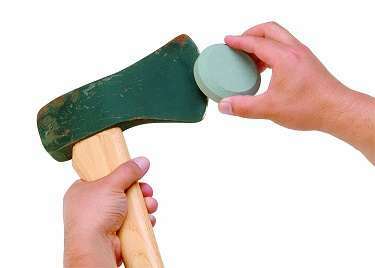 Make sure to move with the bevel and shape of the axe to evenly hone the edge. Flip the axe over and repeat the process on the other side, still moving back and forth against the sharpened edge of the blade. A protective coating can be applied to the blade now. Otherwise, you are finished and your blade should be in pristine condition. Always be sure you are using the correct tools to maintain safety and effectiveness.